This post is about my experience on the Colca Canyon trek and how to choose the best Colca Canyon tour. The Colca Canyon trek can be challenging because of the altitude, but is one of the best things to do in Peru. There are a variety of Colca Canyon tours available in Arequipa, but they differ in quality and activities. From one day tours that do not include the Colca Canyon trek to 3 day tours that bring you to the heart of the Colca Canyon. In this post I will share not only my own experience, but also some advice to consider when booking your Colca Canyon tour. Is the colca canyon trek necessary? How many days do I need for the Colca Canyon trek? Can I do the Colca Canyon trek on my own? I hope this post helps you in choosing the right Colca canyon tour for you or gives you the right directions to do the Colca Canyon trek on your own. I was sweating and my knees were shaking. The bridge, where the rest of the group was waiting for me, was still far below. It was warm and there was no cloud in sight for some relief from the strong sun. My only comfort was that my loyal guide that I just met a couple of hours ago remained by my side. I could have known that the Colca Canyon trek was not going to be easy. The Colca canyon is one of the deepest canyons in the world. In fact, it is twice as deep as the more famous Grand canyon. A combination of altitude sickness with a stomach bug made me one of the slowest hikers that day. The night before when I was still running up and down to the toilet I was thinking about cancelling my tour, but I was stubborn. I put my alarm clock at the early hour of 3 AM ignoring the protesting sounds of my tummy. Luckily I felt better when I woke up the next morning to exchange my bed for a seat in a small tour bus. Despite the early hour Arequipa’s youth was out and about. Young girls and boys stumbled out of bars and discotheques to find their way home. Taxis were waiting eagerly for business while our bus had to maneuver itself through the small streets of Arequipa. It was a 3 hour drive to the Colca Canyon right through a National Reserve with the highest point reaching an altitude of almost 5000 meters. Most of my travel companions continued their sleep, but I was looking outside. As the sun was rising I discover a bare landscape with some shrubs and the occasional group of lama’s and vicuna’s. We had a quick breakfast in Chivay, our first town in the Colca Canyon. The next stop was the Cruz del Condor, the viewpoint where you can see the Condors flying through the canyon. These majestic birds are the reason for our early departure from Arequipa as they are most active between 8 and 9 AM. Our tour only gave us 15 minutes. I was sad we were given such little time, but my body already started to feel the effects of the altitude. We were now above 3500 meters and I felt light headed and tired. After the Condors we were rushed to the starting point of our Colca Canyon trek. It was a 4 hour steep descent to the bottom. I was exhausted when we finally arrived at our homestay in San Juan de Chollo. It was a hard day and I was slightly worried for the coming two days knowing that getting out of the canyon means I will have to climb the same distance up that I went down today. The next day we had an early wakeup call by a small earthquake. I was still a bit shaken from the experience when we started our trek to the next town. Today was much easier, because we were now hiking through the canyon rsther than going down or up. As we passed several villages our guide explained how life is changing since these villages now have a connection with the road. There was a lot of construction going on and simple huts were transformed into concrete houses. Besides these visual transformations lives have been improved by better access to education and healthcare. That night we slept in the Oasis, a tourist resort with a pool where all tourgroups gather. It was a huge contrast with our lodge from the previous night that felt more like a homestay in a village. This place is only for tourists and will give you more insight in the lives of backpackers than the local culture. The Oasis is at the bottom of the steep road up out of the Colca canyon and the next day we had another early start to reach the top around sunrise. It was a tough climb and I did not make it before sunrise, but felt I did a good job getting there within 3 hours. The rest of the day was a somewhat touristic tour past several sites on our way back to Arequipa. After my hike in the canyon it felt a bit unnecessary, but it was nevertheless fun. In Yanque we visited a beautiful old church and ladies in traditional dresses allowed you to take pictures with their lama’s. Still, the views at the viewpoints we stopped at, could not beat the views I experienced during the Colca Canyon trek. It was a tough hike, but for me the best way to get to know about life in the Colca Canyon. What is the Colca Canyon trek? The Colca Canyon is one of the most beautiful areas in Peru famed for its colourful and traditional towns and for its wildlife. There are over 100 species of birds including the giant Andean condor that you can see flying by at the Condor del Cruz. The Colca Canyon is also one of the deepest canyons in the world, twice as deep as the Grand Canyon. The Colca Canyon trek is a challenging hike in and out of the canyon. The Colca Canyon trek starts near the village of Cabanaconda. There are several trekking route options, but they all start with a steep walk down to the bottom of the canyon and end with another steep hike out of the canyon. The western loop (27 km): If you take the western loop you come across the villages of Lahuar, Belen and the Oasis (Sangalle). Most trekking routes can be done in 2 days with an overnight stay in one of the villages. However, the trek is challenging and I would recommend to take at least 3 days for the Colca Canyon trek. This way you will have more time to appreciate the villages you walk through without being completely exhausted. How to choose your Colca Canyon tour? The first thing you have to choose is whether you want to visit the Colca Canyon independently or with a tour through a travel agency and whether you want to include the Colca Canyon trek or not. Is the Colca Canyon trek necessary to visit this area? The Colca Canyon trek is spectacular and if in any way you are able to do this hike you should without doubt. However, if you are physically not able to do the Colca Canyon trek there are enough interesting places to visit on top of the canyon to explore this area. In my opinion the towns on top of the Colca Canyon were a bit set up for tourists, but it will still give you an insight into the unique culture of the Colca Canyon. Most tourgroups will stop for less than an hour in the villages so if you have more time and travel by public transport it is easy to have a more authentic experience. Is a tour necessary to visit the Colca Canyon? You do not need a tour through a ttavel agency to visit the Colca Canyon including the Colca Canyon trek. The trail is well marked and with a bit of planning it is possible to do the trek on your own. This will give you much more freedom and flexibility to explore this region at your own pace. However, you do need enough time and patience and you will probably not be able to visit all the places that are included in the tours. Public transport between the towns on top of the Colca Canyon are infrequent and you need to know the bus times beforehand. For example, Cruz del Condor and Yanque have very limited connections with public transport. If you have limited time I can therefore recommend you to take a tour. If you are adventurous and have enough time (at least 3 – 4 days) you can very well do it on your own. How to travel to the Colca Canyon independently? From Arequipa there are frequent buses to Chivay and even a few buses directly to Cabanaconda where you need to go to start the Colca Canyon trek. From Chivay there are 4 buses per day to Cobanaconde. If you are coming from or continuing your journey to Cusco or Lake Titicaca check my tour Peru bus (Puno) and 4M express (Puno and Cuzco). In the canyon accommodation is available in the villages Chivay, Cabanaconda, Lahuar, Belen, San Juan de Chollo, Cosnirhua, Malata and the Oasis (Sangalle). If you already know your Colca Canyon route it is best to book accomodation online. You can also arrive on the spot, but in high season places may be fully booked. The advantages of taking a Colca Canyon tour? In Arequipa there is no shortage of operators offering tours to the Colca Canyon that include the Colca Canyon trek. The tours are good value (40$ – 50$) and doing it yourself will probably be more expensive. Furthermore, it saves you a lot of time and the tours include different stops along the way. Although touristy some of the viewing points were very beautiful. How many days should I book for my Colca Canyon tour? You can choose between a 1 or 2 day tour by van without the Colca Canyon trek or a 2 to 3 day tour including the Colca Canyon trek. Most tours start at 3 AM to ensure you can see the condors in action at 8 AM. The 1 and 2 day tours by van will stop at some viewpoints and villages on top of the canyon such as Chivay, Yanque and Cobanaconda. The Colca Canyon trek will offer you a much more intimate experience. The Colca Canyon trek is not an easy hike and therefore I would definitely recommend you to take the 3 day tour rather than the 2 day tour. The route is the same so having 3 days makes it much more easier. Really, I don’t think I would have been able to walk in and out of the canyon in 2 days. Another reason is that the 3 day tours stop in San Juan de Chollo for the night, which I thought was a nice village. The 2 day tours stay only at the touristy Oasis. 1 day tour by van (without the trek): only recommended if you are really short on time. It will be a very long day (starting at 3 AM) and most of it is travelling from Arequipa to the Colca Canyon and back with some brief stops at Cruz del Condor and other touristy towns on top of the Canyon. 2 day tour by van (without the trek): Recommended for those that prefer not to do the Colca Canyon trek, but still want to get a good sense of the villages on top of the canyon. Another advantage of the 2 day tour is that you avoid the early start of 3 AM. Because you are sleeping at Colca Canyon you will get to see the Cruz del Condor the next morning. 2 day Colca Canyon trek: If you only have 2 days and you are fit enough this is an option, but your first day will be very long. Starting at 3 Am and hiking all the way from Cabanaconda dowin into the canyon through San Juan de Chollo and then the Oasis in a single day. 3 day Colca Canyon trek: This is the best option in my opinion. You do the same route as the 2 day Colca Canyon trek, but you stay in both San Juan de Chollo and the Oasis (Sangalle). This allows you more time in the villages in the canyon and makes the trek more easygoing. Where should I book my Colca Canyon tour? In Arequipa there are a lot of travel agencies and as I have experience with only one agency it would be hard to recommend one over the other. Do your homework and read some reviews. Prices and quality differs so compare the offers of several travel agencies and check carefully what is included or not. I booked my tour through Peru Hop and also visited Ica with them. You can read about my experience with Peru Hop and about my experiences in Ica in my post on things to do in Ica: Peru’s best kept secret. 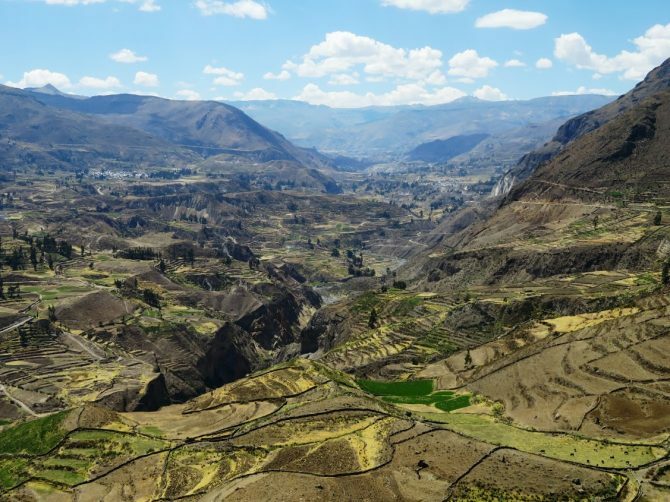 The Colca Canyon tour brings you to high altitudes. Chivay is at 3632 meters altitude sickness is a real possibility. It is hard to predict who will suffer, but symptoms range from feeling a bit dizzy and tired to a severe headache and vomiting. Local remedies include drinking coca tea, chewing on coca leaves or using something called agua de florida. Whether they are really effective is up to debate. What does help prevent altitude sickness is acclimatization. This starts in Arequipa that is at an altitude of 2325 meters. Spend at least one or two days in Arequipa before you head to the Colca Canyon. The sun is strong in the Colca Canyon and during the trek there is not a lot of shade. Bring something to protect your head, sunscreen and enough water to prevent sunburn and a heatstroke. This sounds like an amazing experience and looks like a beautiful place. I had no idea Colca Canyon is twice as deep as the Grand Canyon and the part about being woken up by a small earthquake.. WOW! So sad we missed this when we were in Peru – looks incredible! I definitely don’t miss being at altitude though, that was the toughest part of travelling in South America for us. Great read Ellis, I’ve not walked/hiked in a high altitude area but I can imagine it must be really tough on your body – i’m really impressed you managed to get up at 3am despite not feeling well!! Great post & photos! I just did an article on ten amazing places in Peru that are not Machu Picchu — this was one of them. Hope to see it in person some day. Great snaps!! … Good that you managed the travel and hike inspite the altitude sickness and the tummy bug issue. Also good to see these villages as you hike the Colca canyon. Colca canyon is indeed very deep if its twice as deep as the Grand canyon!! Loved those birds too Condors flying about!! This canyon seems like a great idea! Hiking there would be a dream come true!